Keith R. Porter is widely recognized as a founding father of modern cell biology. His innovative methodology for the use of the electron microscope, design of the Porter-Blum microtome, and techniques for tissue culturing opened up the field of cell biology by allowing much greater insight into the structure and function of cells. 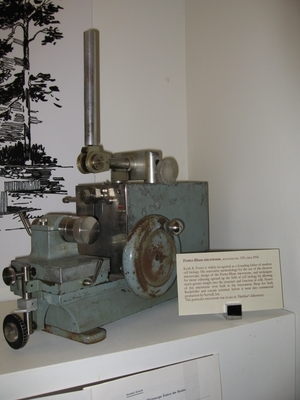 Scores of this microtome were built in the Instrument Shop for both Rockefeller and outside scientists before it went into commercial production by Sorwall, Inc. This particular microtome was in use in Hartline’s laboratory.